Sometimes life is like a terrible joke. What goes "ring-ring, ring-ring, ring-ring, ARGH!" [Insert blind celebrity here] answering the iron. Dohohoho. It's funny because they're blind. Chances are you've heard that one before, probably in or around the schoolyard. When I was a boy, Stevie Wonder was the punchline of choice, but in a pinch you can use David Blunkett, Ray Charles or even Andrea Bocelli. Now you can add Polish gentleman, Thomas Paczkowski, to that list, and he isn't even blind. According to a report on local news service, Fakt.pl, Paczkowski was relaxing in front of the telly with a few beers when he decided to press a couple of shirts, as you do. He plugged in his electric iron, put it down next to his chair to warm up and started watching a boxing match. You can probably guess what happened next. Though for the less imaginative among you, that tame picture of Paczkowski's bandaged head might just give you some idea. 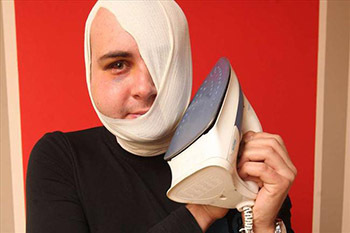 The unfortunate Pole required medical attention for the burns he received, and while his experience with fate's terrible sense of humor hasn't put him off ironing, it has apparently curbed his enthusiasm for televised sport. So, a man answered his iron. Now all we need is for an Irishman to suffer a head injury as a result of walking into a bar and at least one chicken-related traffic accident and the year will be complete.